Photographing the eclipse but I have to pee at the same time. It’s a cloudy August 21, 2017 morning and there is a solar eclipse about to happen. I have my Sony A7R II with the Sigma 150-600mm lens and a 95mm 18 stop filter mounted on a Vanguard tripod ready to shoot the eclipse, a GoPro Hero 5 on the ground shooting time-lapse and finally a Samsung Gear 360 camera for 360 coverage. One problem, I have to pee. I’m no public urinator and I’m not about to pack up my gear and miss my only chance at photographing the eclipse that is already underway so I tough it out and keep shooting. I’m thinking to myself should I leave? Because of the clouds I’ve already missed the better first half of the eclipse. It is really worth the wear and tear on my bladder? YES IT IS! I power through it and got some pretty good shots. When I first heard about the solar eclipse I really didn’t care and wasn’t going to spend anytime on it. Well, I don’t what happened but the eclipse bug bit me and bit me good. Next thing I know I’m researching how to photograph it, what filter I’ll need, where to buy the filter, should I get glasses for the eclipse and where to buy them too! Within a few YouTube videos I was well on my way to knowing how to photograph it and what to buy to make this happen. Getting my hands on an 18 stop filter was pretty easy to get but I gotta say, the toughest thing to get was the Solar Glasses. I just waited to long to get on board with eclipse mania. My sister (Millie Panama) and I searched everywhere with no luck. We didn’t have time to order any so we checked on the NASA website for official places to buy them. We wound up checking with Toy”R”Us, Walmart, 7-11, Lowes and many other places but every store we called was out. Our next target was Craiglist and boom we found them. Problem, price gouging. Yep the greed bug has now bitten just about everyone and prices were starting at around $40 per pair up to $999. Wait a minute, can it be true? We found an ad showing that this person had them and was selling them for $10 per pair! My sister called and confirmed the inventory and price, yes, it was true and we finally had everything we needed for my photoshoot. 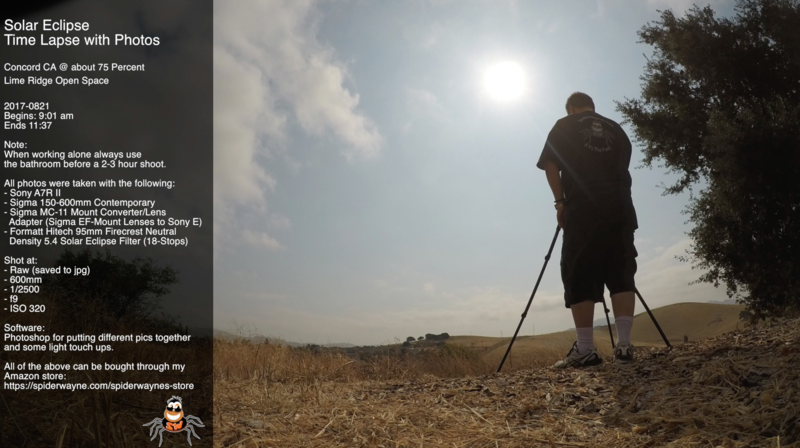 August 20th, the day before the eclipse I got up and scouted a spot up at Lime Ridge Open Space in Concord CA. At the time this seemed like a good spot. It was around the right time, the sky was clear and nothing was in between me and the sun so I took some practice shots which came out nicely. Yes, the day-before photos of the sun came out nicely but on the day of the eclipse I realized I had made one mistake, I didn’t account for the possibility of clouds. In fact , it was very cloudy and I missed the first half of the eclipse! In hindsight I should have went much high up. Mt Diablo which is also close by would have been a much better place but I screwed up and it was too late to change location now. I saw a crack in the clouds, I can actually see a partial eclipse hiding behind a thin layer of clouds! I try to focus but it’s too late! The clouds were back so now it’s a waiting game but oh no, I have to pee! Wait, the clouds are thinning, I start shooting and I get a shot! I re-focus and I get another and another! Well, yes and no. Because of my location, Northern Ca, I’m not actually in the full path of the eclipse but only 75% of it. I did however get some good shots of that 75%! In fact, because I was bracketing my shots, I wound up with a little over a thousand photos. On a side-note, the GoPro time-lapse took over 11 thousand shots! Let’s get back to the thousand shots. After going through all the shots of the eclipse I had to decide what to do with them. Do I just use one, the best one and be done with it? Nope, I decided to show the progression of the eclipse to I made the canvas larger and stuck all the best photos of the progression onto one photo. Check out this time-lapse of me taking my first eclipse photos.